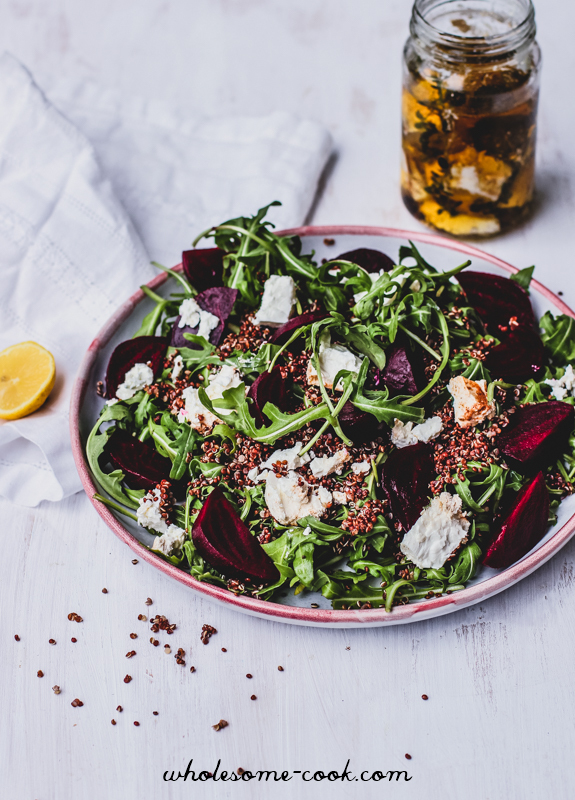 The sweet and slightly tart combination of beetroot and feta is a classic in its own right but I find it especially wonderful against the peppery rocket and nutty quinoa. Beetroot is also a great liver and blood cleanser which is perfect for detoxing after a cold or a big night out. Speaking of which, last weekend I attended a gorgeous wedding on the outskirts of the Hunter Valley. It was as country as you can get with the bride arriving by ute, the couple getting married in the bull paddock and the reception held on the greens of a homestead nearby, complete with local wines and an amazing cold food spread set up in the barn. I might have had quite a few proseccos, not enough to warrant a headache in the morning, but still beetroot salad the next day was a nice antidote to the partying the night before. I utterly love beetroots in all their incarnations – I am especially fond of a Beetroot Mash, if you’ve never tried it, I really encourage you to have a go. It pairs so well with fish or pork, truly amazing. With the weather warming up a little, heralding the arrival of the salad season, I thought I’d share this simple recipe that ticks many boxes. It can be enjoyed as a main or side. Top it with some hot-smoked salmon or trout and you have a delicious meal, and totally totable for work. If you don’t have feta, you can also serve this with the tangy creamy yoghurt cheese (labne) – see above. I love the spreadable nature of that cheese, with a nice probiotic boost from the yoghurt. Perfect. 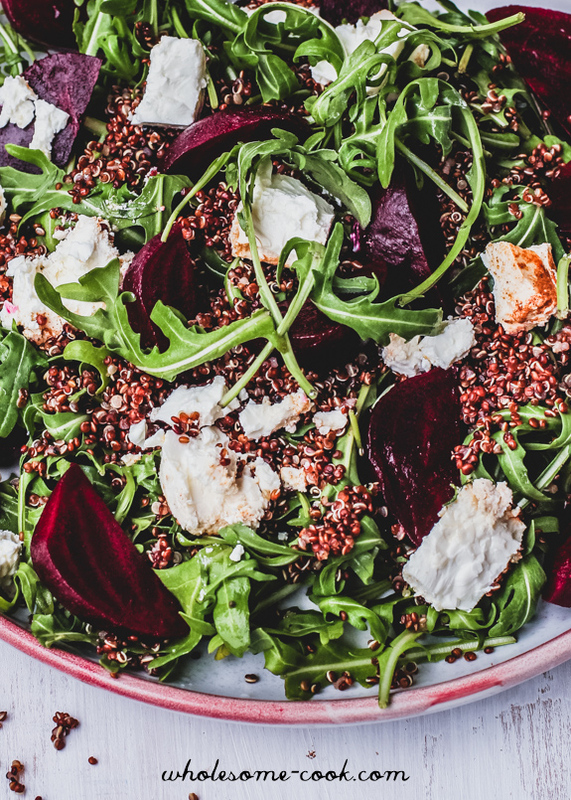 The sweet and slightly tart combination of beetroot and feta is a classic in its own right but I find it especially wonderful against the peppery rocket and nutty quinoa. Beetroot is also a great liver and blood cleanser which is perfect for detoxing after a big night out. 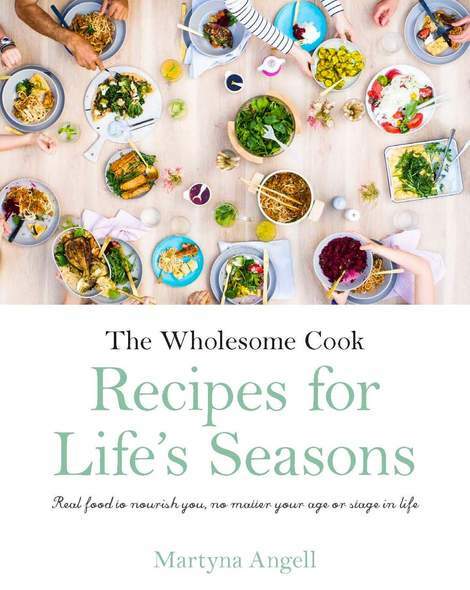 If using raw beets, place unpeeled beetroots in a small saucepan and cover with water. Bring to a boil and cook for 15 minutes. Drain and allow to cool slightly before peeling. Cut into wedges. In the meantime, place quinoa in a small saucepan and cover with ½ cup water. Bring to a boil, then reduce heat and cook covered for 10-12 minutes or until tender. Drain and allow to cool slightly. Arrange rocket on a serving platter. 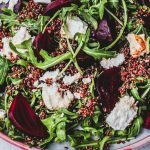 Top with quinoa, beetroot wedges, crumbled feta. Drizzle the salad with oil, lemon juice and sprinkle with thyme leaves. Season well with freshly cracked black pepper. This salad also goes amazingly well with leftover roast or barbecue lamb, or hot-smoked salmon or trout.